Notes: On this day at John`s home, John and Yoko produced two avant garde films that they called "Film No. 5" (aka "Smile") & "Two Virgins". 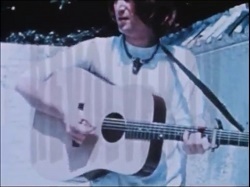 During the day the cameraman, William Wareing, also shot some 16mm black and white & colour home movie footage of the proceedings which captured John playing his acoustic guitar. The footage was sold at auction in 1987 and subsequently leaked out into collectors circles. Initially only 3 1/2 minutes or so of footage found its way into collectors hands but since then "Revolver" uploaded 5 1/2 mins of black and white & colour footage onto Youtube. 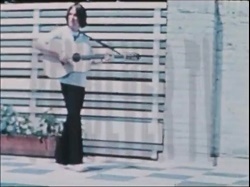 This footage complete with the imposing "Revolver" logo across the screen has now been bootlegged. 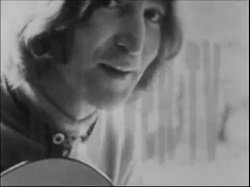 This may or may not be the same footage sold at auction but in any case, at the end of the footage, it carries a title of "Yoko and John" so this implies that this was actually edited footage made into a proper film albeit just home movies.